With a new introduction, acclaimed director and screenwriter Paul Schrader revisits and updates his contemplation of slow cinema over the past fifty years. Unlike the style of psychological realism, which dominates film, the transcendental style expresses a spiritual state by means of austere camerawork, acting devoid of self-consciousness, and editing that avoids editorial comment. 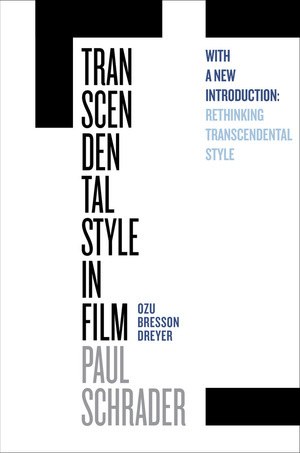 This seminal text analyzes the film style of three great directors—Yasujiro Ozu, Robert Bresson, and Carl Dreyer—and posits a common dramatic language used by these artists from divergent cultures. The new edition updates Schrader’s theoretical framework and extends his theory to the works of Andrei Tarkovsky (Russia), Béla Tarr (Hungary), Theo Angelopoulos (Greece), and Nuri Bilge Ceylan (Turkey), among others. This key work by one of our most searching directors and writers is widely cited and used in film and art classes. With evocative prose and nimble associations, Schrader consistently urges readers and viewers alike to keep exploring the world of the art film.